Our Students’ Privacy and Anonymity are of Paramount Importance. Who Gets “Proof of Enrollment”, “Progress Report” & “Proof of Completion” Information. This is very important information that the courts have required from you. 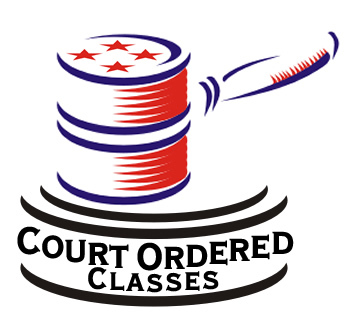 Upon registration our students submit to us, Court Ordered Classes, name, birth date, court information and a court case number(s) which are mandatory requirements for all court documents such as: Proof of Enrollment, Progress Reports and Proof of Completion. These certificates are sent to you, our registrant, to the address that you have provided during enrollment, and the court or probation office assigned to your case. This information goes nowhere else, period. We restrict access to your personal and billing information to those employees who need to know that information to provide products or services to you. Employees who violate these standards will be subject to disciplinary measures. Our physical, electronic, and procedural safeguards meet or exceed federal standards regarding the protection of your nonpublic personal information. We use technological means such as backup files, virus detection, eradication software and firewalls to protect against unauthorized access or alterations to customer data and we maintain policies and procedures covering the proper physical security of workplaces and records. We continually strive to maintain complete, accurate and up to date information. If ever you believe that our records contain inaccurate or incomplete information, please contact us at (661) 312-0392. We will investigate your concerns and correct any inaccuracies in a timely manner. We reserve the right to change this policy at anytime but would communicate any significant changes to you as required by applicable law. Access logs are text files, automatically generated by the Web server, that report which pages and files have been requested by visitors. These logs do contain the Internet Protocol (IP) number of site visitors, but make no effort to match that IP number with any other data. In most cases, the IP numbers are only used in the most general sense, such as telling us that a visitor was coming in from google or yahoo, as opposed to identifying the visitor explicitly. However, the number is recorded, and can be accessed in the future. This is standard practice at every Web site you ever visit. Most will not explicitly tell you about this, but we believe in maximum privacy and full disclosure.